I have the best job on the planet! I love what I get to do as I see life-change happen in kids and families. I know without a shadow of a doubt that it takes many people to make the weekend happen at NewSpring. I am thankful for the many of you who have found your place in volunteering at NewSpring. Every single volunteer is valuable to make NewSpring an inviting place for guests. If you have not yet found your niche for volunteering, I have an opportunity for you to step up and get involved. 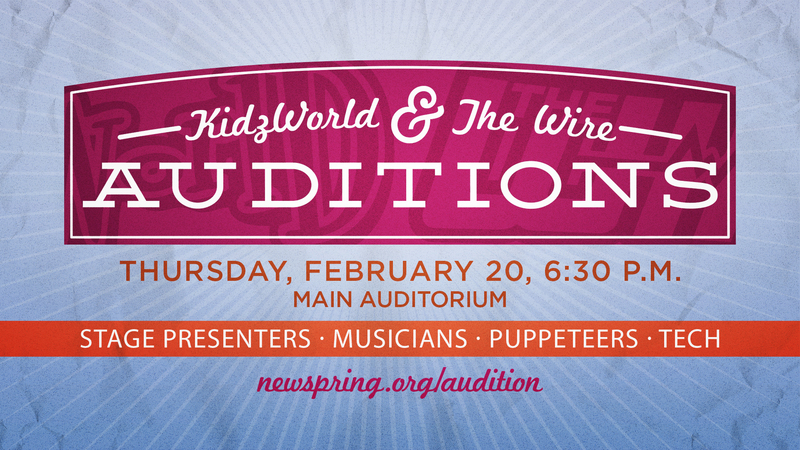 Tomorrow, Thursday, February 20, KidzWorld and The Wire are hosting auditions for tech, puppeteers, musicians, actors and actresses as well as Adventure Avenue Praise Team members. If you want to have a impact on the next generation, I invite you to come out tomorrow evening at 6:30 p.m. We will meet in the auditorium first and divide up from there for individualized auditions. We are going to have lots of fun and some great give-aways. Whether you want to help in KidzWorld or The Wire, please come tomorrow night. For those who may not feel comfortable on stage but would love to engage kids and students on a small group level, we need you too! This weekend you can stop by Volunteer Training (in Adventure Avenue) after any service to ask questions and fill out a volunteer application. My prayer is that you will ask God to show you where He wants you to serve at NewSpring and then take the steps to make it happen! You will be glad you did!